Sensei Len Sim is a Nanadan (7th Dan), Okinawan Goju-Ryu Karate. He began training in March 1967, and started Wokingham Karate Academy in 1984. Sensei Henrieheta Sim is Rokudan (6th Dan) and has been responsible for the junior section of the club since she set it up in 1985. Henrieheta holds a bronze medal from the 1991 World Championships in Okinawa, Japan. Skills and knowledge in coaching, safety, teaching children, supporting those with special needs, refereeing and first aid are all basic requirements for a karate instructor and both of our senior instructors have taught some of these, attended many appropriate courses and gained qualifications to help maintain the high standard of our club. They are also CRB checked to enhanced level and are active in the leadership of the Wokingham Vineyard Christian Fellowship. I have practised for almost 40 years, after starting in 1967 in Dunfermline, Scotland. I trained in Chito-Ryu, Yoseikan (Shotokan) and Goju-Ryu and collected a few trophies along the way, including British Karate Federation Kata champion. I competed in the BKCC championships from 1973 to 1976 as well as captained two international tours to South Africa. After I moved south to Havant and started clubs in that area, I met Sensei James Rousseau in 1974 and he has been my teacher ever since. As a founder of the IOGKF, I spent many, many hours improving my Goju Ryu under Sensei Chinen and Sensei Higaonna. I opened the Wokingham club in 1984 assisted by Bill Cuzzocrea. Spin off clubs opened in Sandhurst, Owlsmoor and Sonning. For those who are interested, more information about my karate story and my teacher is available by clicking the links. Today I run a company providing my invention – a Virtual Queuing System, to theme parks. I began training in 1975 in Booysens, Johannesburg, and gained Shodan in July 1985, at the IOGKF Gasshuku in Stellenbosch, South Africa, where I met my future husband, who made no mention of me in his section above. I moved to England and Sensei James Rousseau gave me away at our wedding in January,1986. I represented EGKA at a number of international tournaments, have won a number of UK Gold medals for kata and my competition highlight was my Bronze medal for Kata at the IOGKF world championship in Okinawa in 1991. At the associated IOGKF Gasshuku I met some interesting people including the Prince of Mongolia and had one-to-one training with one of the IOGKF advisors, Sensei Aragaki. Both my sons are actively training and our oldest, Lenny gained his junior Shodan at the GKI gasshuku in Chichester in summer 2002 and his cadet Nidan in 2004 at our Gasshuku in Chelmsford. 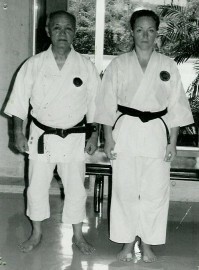 His shodan grading was taken by Sensei Arnold De Beer, my old instructor and Sensei Len, my husband. Sensei Jame s Rousseau chaired his nidan grading panel. David won his 3rd kyu brown belt in 2003 GKI gasshuku held in Sweden and is now working towards his black belt. In August 2006, I was successful in my grading for 6th Dan. This was awarded by Shihan James Rousseau, 8th Dan. Alex Sim, Sandan; Bill Cuzzocrea, Sandan; Terry Perks, Nidan; Ann Rich, Shodan; Mathew Taylor, Shodan; Norma Robertson Shodan; Roger Deed, Shodan; John Barnes Shodan; Carolyn Sim, Shodan; Darren Pickard, Shodan.